Plants 6-26 cm. Pseudobulbs ovoid, 10 × 5 mm, sheathed by bracts and persistent leaf bases, previous year´s pseudobulb usually present, connected by short rhizome. Stems pale green or yellowish green, angled, sometimes obscurely winged or fluted distally. Leaves 2; blade conduplicate, green, glossy, oblong-elliptic to elliptic-lanceolate, keeled abaxially, 3.7-18 × 1-4 cm, succulent, apex obtuse to subacute. Inflorescences 2-10 cm; floral bracts subulate, minute, 2 × 1 mm, apex acute; pedicels slender, 3-5 mm. Flowers 2-15, green or yellowish green to yellowish white or greenish white; dorsal sepal oblong-lanceolate to narrowly lanceolate, 4.5-6 × 1-2 mm, apex obtuse to acute; lateral sepals oblong-lanceolate to narrowly lanceolate, 4.5-5.5 × 1-2.2 mm, apex obtuse to acute; petals pendent, slightly curved, tubular, filiform, 4.5-5.5 × 0.5-1 mm, margins strongly revolute; lip translucent to opaque, green or yellowish green to yellowish white, obovate to oblong to suborbiculate, 4-5.5 × 2.2-3.5 mm, base narrowly cuneate, slightly auriculate, margins crenulate-wavy, apex subtruncate to obtuse, mucronate; disc with central elongate thickening; column short, stout, 2-3 × 0.5-1 mm, winged apically; anthers yellow; pollinia yellow. Capsules: pedicel 3-7 mm; body obovate to ellipsoid, 9-13 × 3-6 mm, veins often slightly winged. 2n = 32, 26. Flowering May--Aug. Cool, moist ravines, bogs, or fens, wet peaty or sandy meadows, and exposed sand along edges of lakes, often colonizing previously open and disturbed habitats during early and middle stages of reforestation; 100--1100 m; B.C., Man., N.B., N.W.T., N.S., Ont., P.E.I., Que., Sask. ; Ala., Ark., Conn., Del., Ill., Ind., Iowa, Kans., Ky., Maine, Md., Mass., Mich., Minn., Miss., Mo., Mont., Nebr., N.H., N.J., N.Y., N.C., Ohio, Pa., R.I., Tenn., Vt., Va., Wash., W.Va., Wis.; w, c Europe. Liparis loeselii is such a small orchid that it can be easily overlooked; it may have a wider distribution than has been reported. Rain-assisted self-pollination in this species was described by P. M. Catling (1980). Perennial herb 6 - 25 cm tall Stem: one, erect, pale green to yellow-green, angled, obscurely winged or fluted, and hairless. Leaves: two (one in sterile plants), ascending-spreading, more or less basal, stalkless, clasping, strongly sheathing at base, partially folded lengthwise, light yellowish green, glossy, shiny, non-toothed, hairless, sleek, fleshy, 2.5 - 20 cm long, 1 - 8 cm wide, elliptic to lance-shaped, widest just above middle, tapering to wide fairly blunt tip, and lengthwise ridge (keel) along lower surface. Inflorescence: a single, erect, terminal, long-stalked (4 - 15 cm), loose to dense, spike-like cluster of two to fifteen slender-stalked flowers. Each slender, 3 - 5 mm long flower stalk is subtended by a single, minute (2 mm long, 1 mm wide), awl-shaped, pointed, hairless bract. Flowers: green or yellowish fading to white, delicate, small (under 2 cm long), bilaterally symmetric, open (sepals and petals spreading), with lowest petal formed into a narrow arched lip, but lacking a spur. The reproductive parts of stamens, stigma and style are fused into a short, stout, exposed column above the hairless inferior ovary. Sepals: three, spreading, greenish yellow, hairless, 4.5 - 6 mm long, 1 - 2.2 mm wide, oblong to narrowly lance-shaped with blunt or shallow-pointed tips, and rolled edges. Fruit: several, short-stalked (3 - 7 mm), erect, inversely egg-shaped to ellipsoid, 0.9 - 1.3 cm long, 3 - 6 mm wide, hairless capsules with slightly winged lengthwise veins. Root system: of a bulbous, egg-shaped, 1 cm long, 0.5 cm wide, fleshy pseudobulb with slender, fleshy, fibrous roots below, and sheathed at top by bracts and persistent leaf bases from previous season. Column: exposed, arching above lip petal, more or less yellow (anthers and pollinia yellow), short (2 - 3 mm long), stout (0.5 - 1 mm wide), and winged. Lateral petals: two, drooping to slightly spreading, slightly curved backwards, greenish yellow, 4.5 - 5.5 mm long, 0.3 - 1 mm wide, threadlike, tubular with strongly rolled edges. Lip petal: one, central, translucent, yellowish green, 0.4 - 0.6 cm long, 2.2 - 3.5 mm wide, narrowly inversely egg-shaped to oblong, with narrowed base, an abruptly rounded tip with wavy edges and a very small sharp point at very center. The lip is obviously arched or slightly recurved near its middle, around which the central area of the upper surface has elongate thickenings and five prominent veins. 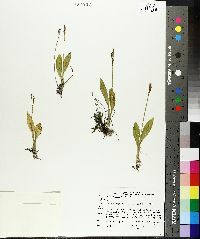 Similar species: Liparis loeselii is most similar to L. liliifolia, but that species occurs in uplands, has wider more egg-shaped leaves, longer flower stalks and ovaries, purplish flowers, longer and much wider lip petals (over 0.8 cm long, over 5 mm wide), a longer column (3 - 4 mm), and longer fruiting stalks that are at least as long as the capsule length and usually longer. 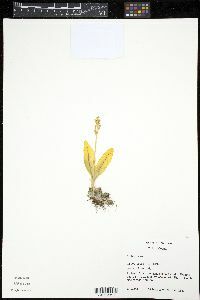 Some may consider Platanthera orbiculata similar as well, but that species has much more rounded leaves that lie flat or close to the substrate, the stem has two to four small alternate bracts below the inflorescence, and the flowers have long (up to 2 cm), slender, backward pointed spurs. Habitat and ecology: Not common, localized, a wetland plant usually preferring rather sterile, moist, calcareous soils, full sun (though can tolerate partial shade), and minimal competition, thus a lack of dense plant cover. Usually in peaty soils where it is more open, including bogs, moist calcareous sands, marly fens, and seeps. Notes: This is a more northern species than L. lillifolia, which occurs at more central latitudes. However, L. loeselii seems to be advancing southward, at least in Indiana (see Homoya p. 138). This is a self-pollinating species, in which pollination is assisted by rain drops (Catling 1980). Etymology: Liparis is derived from the Greek word liparos for fat or greasy, and refers to the oily look and slick texture of the leaves. Loeselii is named after Johann Loesel, an early German botanist. The majority of my specimens were found in sphagnum in tamarack bogs and in open boggy places. It is very local and is restricted to the lake area. In addition to the counties shown on the map it has been reported from Fulton, Kosciusko, La Porte, and Marshall Counties. It has already become very rare. Scape 1-2.5 dm, with a loose raceme of 2-12 fls; lvs lanceolate to elliptic, 5-15 נ2-3(-5) cm, somewhat folded along the midrib; pedicels 3-5 mm; sep yellowish-green, 5-6 mm; pet yellowish-green, 5 mm, somewhat reflexed; lip 5 mm, ascending at the narrowed base, the blade yellowish-green, broadly ovate with upturned margins; column 3 mm; 2n=32. Damp or wet woods; N.S. and Que. to Man., s. to N.J., O., Nebr., Kans., Mo., and in the mts. to Ala.; Europe. June, July.